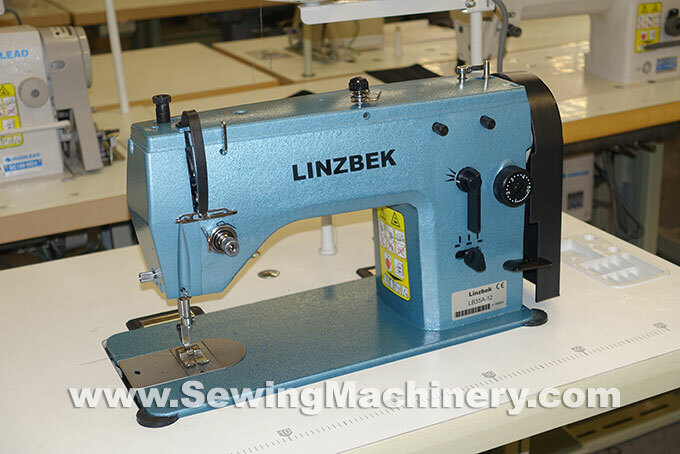 The Linzbek LB35A-12 has been introduced for users requiring a versatile Zigzag and straight stitch general purpose sewing machine, for use with light to medium weight materials. It is a robust metal bodied semi-industrial model; ideal for tailors, alteration shops, designers, dress makers, sewing schools/colleges, theatres, home workers and professional seamstresses etc. A wide Zigzag width is available, which is user adjustable between 0 to 12 millimetres. Stitch length is dial adjustable between 1 to 5 millimetres. With the stitch width set to 0 millimetres the machine produces a straight lockstitch. The incorporated needle bar locking device ensures good quality straight stitching with-out the stagger associated with standard zigzag models. The LB35A-12 model can also be set in free hand embroidery stitching mode (Irish embroidery / satin stitch embroidery & darning stitching). After setup: the knee adjusting device controls the zigzag width, in real-time, while you are sewing. Moving your knee changes the width from straight/narrow stitching to various zigzag widths for decorative embroidery finishes & functional "fill-in" stitching. Needle position is operator selectable for stitching on the left, centre or right; which is useful when sewing button-hole and other close stitching styles. The latest industrial Linzbek servo motor is fitted as standard equipment. It offers greater energy efficiency, when compared to a conventional clutch motor, with energy savings of up to 70%. It features electronic acceleration control allowing the user to start slowly and gradually increase speed by pressing the sewing machine foot treadle. Acceleration is smooth and under the users control to allow a comfortable running speed matched to the job at hand. Supplied assembled with full sized industrial unit stand, table top and makers accessories. Straight stitch up-to 5mm per stitch. 230V standard 3 pin UK household plug.